Click to viewFederation space stations guarded by expansive sensors snake across the Alpha Quadrant. 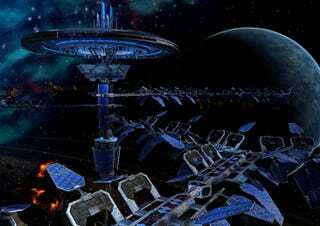 Cryptic Studios have released screen shots that give future gamers a look into the brand new Star Trek Online universe. From the looks of things the Federation is a force to be reckoned with. Click through to see a gallery of the final frontier including a shadowy glimpse of a CG Andorian. In this MMO players will be able to customize characters and their ships. Exploration isn't limited to already-existing Trek planets and races although Andorians and Klingons will be making appearnces (according to hints from the game site). Cryptic Studios also announced that they will be revealing gameplay footage of the new Star Trek Online video game at the Star Trek convention in Las Vegas August 10.